Do you want to master everything about scuba diving? Do you want to make it a career? Then enroll in our PADI Divemaster course today! The Divemaster course is an extensive program wherein you will undergo rigorous training and internship in Nemo Diving Center for a period of seven to fifteen days. Under our tutelage, we will enhance your problem-solving skills by putting you through numerous tests and scenarios as well as teach you how to prevent and deal with underwater emergencies. No need to worry about the scuba diving equipment because it will be provided for you in this course. When you complete the program, you will be eligible to conduct scuba reviews, supervise training activities, act as professional guides, as well as manage skin diver courses and assist in Discover Scuba programs. As a divemaster, you can rise as a role model or make diving a profession. After payment, you can begin your web-based self-study of scuba diving theories in the convenience of your home and at your own pace. When you receive the email from PADI with the redeem code, you can create your own account on the PADI website to access the Open Water Touch app or Open Water Manual. Please check your inbox as the email will be sent within 24 hours. The series of interactive materials can serve as a reference during and after the course. Once you passed the final exam and table exam then you’re all set for the next phase of the course. After fulfilling the e-Learning requirement, you can begin your in-water training. Just select the most convenient schedule for you and we can make the necessary arrangements. 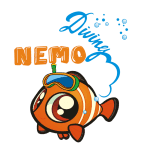 We will see you at the Nemo Diving Center on the agreed schedule to complete some forms and try on your scuba equipment. After that, you can proceed to the beach of Dukes Hotel in Dubai with our PADI-certified instructors to undergo training, attend workshops, participate in dive scenarios, and assist your instructor with other students. We strongly recommend completing the e-Learning materials first before undergoing the internship as it will prepare you for actual dive sessions.